Major clean-ups, crime prevention events and safety workshops for young people were among the many highlights of the Safer 6 campaign’s second week, which had a special focus on Tipton. Each of Sandwell’s six towns has a focus week during the autumn Safer 6 campaign. The Tipton week kicked off with an information roadshow at Asda Great Bridge, where nearly 200 people picked up community safety and healthy living advice from a wide range of services and organisations. At the roadshow, Sandwell Crime Prevention Panel volunteers spoke to 98 people, handing out 94 purse bells, 73 sleeves to protect debit/credit cards, 64 property marking packs, 32 personal alarms and 25 door/window alarms. Offenders doing Community Payback carried out 165 hours of unpaid work, clearing 1.7 tonnes of dumped rubbish and overgrowth at Fred Perry Walkway and Upper Church Lane open space, including the passageway to Stella Road. The council’s estate maintenance teams removed 1.2 tonnes of overgrown shrubbery in the Newhall Street area to improve access for residents. The council’s young people’s services ran stay safe workshops with the Youth Bus, speaking to nearly 100 young people about online safety, darker nights, the risks of smoking, alcohol and drugs, and how music and drama can help address mental health issues. Sessions were held at Coneygre Youth Arts Centre, Tipton Youth Club at Malthouse, Tibbington Estate and Park Lane Estate. 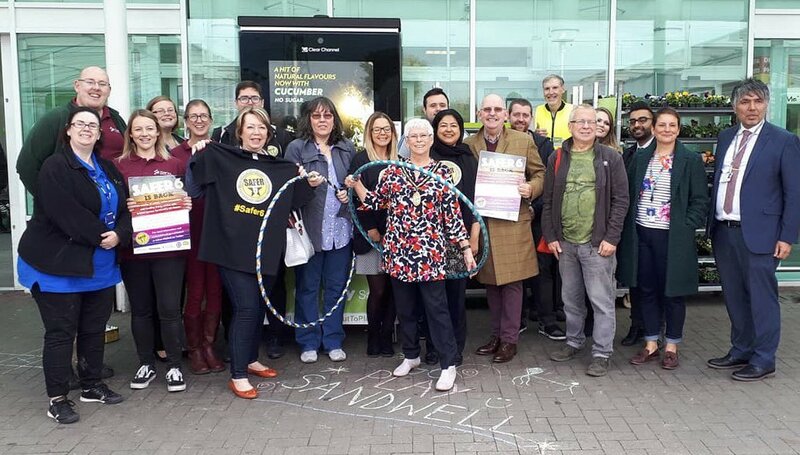 Asda Great Bridge hosted the anti-slavery van, to help council officers and police raise awareness of slavery and exploitation and how to report it. The council’s anti-social behaviour team promoted the car cruising injunction and work to tackle nuisance motorbikes. The team, with police and neighbourhood officers, also gave advice to residents and carried out targeted visits to suspected offenders in Dudley Port and on the Tibbington, Park Lane and Lost City estates. Police held an information sharing event, supported by council officers, on the Park Lane Estate, introducing the neighbourhood police team and discussing local issues with people. A ‘super surgery’ was held at Great Bridge Library with councillors, neighbourhood and anti-social behaviour officers and Black Country Women’s Aid. Police, Tipton Community Operating Group (COG) and young people's services held sessions with more than 1,000 young people to raise awareness about the dangers of knife crime. Police also carried out a ‘knife sweep’ at Jubilee Park – no knives were found. Domestic abuse team staff visited hairdressing salons and other businesses to provide support and advice. Community speedwatch events were co-ordinated by police near RSA Academy and in Bloomfield Road, checking vehicle speeds and issuing warning letters to those driving over the speed limit. Litterwatch and Tipton Local office held volunteer litter picks at The Railer, off Wednesbury Oak Road, collecting 14 bags of litter, seven bags of recycling and 14 abandoned shopping trollies, and at Park Lane East, collecting 16 bags of litter and nine bags of recycling. They also held skip day and litter pick at the canal towpath at Jay Avenue, Dudley Port. Tipton COG (Community Operating Group) and partner organisations held a Parenting Pals coffee morning at Tipton Christian Church, offering good practice and advice around parenting, staying safe, online safety and exploitation. Go Play Sandwell held Let’s Play sessions at Glebefields Library and Tipton Library, and promoted their sessions at the Asda Great Bridge roadshow. Police and anti-social behaviour officers held a hate crime surgery in Dudley Port to gather intelligence and distributed leaflets on the Tibbington Estate to help raise awareness of hate crime and how to report it. Anti-social behaviour officers, councillors and the Friends of Farley Park held a walkabout at Farley Park. Skip days were held by Tipton Local office at Bloomfield Terrace, Hawthorn Road, North Road and Denbigh Road. Tipton Local office carried out visits across the town with environmental protection officers. Trading standards and anti-fraud officers also joined police, fire and Tipton Local officers to give advice to residents on a range of issues. Fire safety and electrical appliance safety checks were offered to residents at Horton Street flats. Councillor Ann Jarvis, Tipton town chair, said: "I would like to thank everyone who has taken part in our Safer 6 week to make Tipton safer and cleaner. It's great to see partner organisations working to provide information, advice and reassurance to people of all ages across the town." The Tipton week was held from 8-14 October. Go to our Safer 6 webpage for more information on the campaign across the six towns.